One of my favorite memories of Sunday mornings in New Jersey, and sometimes even on Shabbat afternoons, was the arrival of the famed “Sunday newspaper.” Anyone who grew up in America knows of the delights of the Sunday paper. The pictures and comics are in full bleed color, and there are many more sections than usual. The sports section in our local paper has the best writing on basketball on Sundays. And of course, the main reason for getting the Sunday paper – finding out what's on sale this week. Sale (and even more so, clearance) is among the most important concepts in American culture. I don't think I've bought something at a regular price in the USA in the last 10 years, save for essential items like milk. Never mind that the sales are sometimes bogus and just make the item seem cheaper, there is a sense of recoil when one shops in America and doesn't come out of the store with a bargain. Sale is ingrained in our culture, in our minds, in our attitude. If we think about how many times we are given a sale-related “stimulus,” be it an advertisement or the like, the numbers are staggering. We (I am speaking to Americans primarily) are walking sale-hunters, ready to wake up at 6AM the day after Thanksgiving or drive out to a rural outlet mall to get that 70% off we always wanted. The sale culture can seep into religious life as well. Consider our approach to the month of Tishrei. It is the month of repentance. We can sin for 362 days a year – and then plea, for 3 sincere days, to be written in the “book of life.” We don't deserve it, but we ask for it. We only have 60% of the merits to get into the book of life. The other 40% we get from the great deal that God is offering us. Is that really how it is? Everything comes at an expense. Ask any economist, even me, what the real-world expense is of the consumer culture is in America - the answer is not a pleasing one. Divine Mercy, in the Jewish tradition, is the fact that we can live through the day – if we were judged instantly – then the second we had too many sins, we would get zapped. We have to fit into a system that's possible. Mercy, however, does not mean that we get a 40% off deal on our sins. We are judged for everything we do, good or bad, seen or unseen. We can't hire lawyers. We can't present coupons. Paraphrasing Rabbeinu Yonah of Gerondi – who explains very simply the guiding principle of Teshuva - “one must look at themselves as they have a clean slate,” this is in order to be able to move forward and start doing things the right way without the weight of the past. But this is a method of motivation to get started on the process of change. It doesn't mean that we are all of a sudden given the free pass. If we always get the discount, we will never change. We have to change so that we ourselves are 40% better than the past (or 5 or 10 or 20%). Let us all merit this year in claiming that we changed ourselves, for the better, at full price. who risk their lives daily in order to protect nation and homeland. incomplete until Amalek is blotted out. weapon that will vanquish our enemies, and that weapon is Hashem Almighty Himself! in you, and turn away from you” (Dvarim 23:15). The greatest protection for the State of Israel from its enemies is being a “holy camp”. There were three reasons why I chose to study abroad in Israel a couple of years ago. The first reason was to be in Israel, where so much history and important events have taken place. To be able to live in such a holy land appealed to me and it was so amazing to just be in the land and see all the great places. The second reason was because I wanted to be around fellow Jews interested in Judaism who were also great people. The third reason was to learn more about Judaism, and as I was learning Hebrew in school to be able to learn straight from the texts as well. Shortly after I arrived in Jerusalem I found out about the Beit Midrash Program. I went the first week and I instantly fell in love with it. I realized this program incorporated all three reasons why I chose Jerusalem. I realized the location could not be better with a balcony right outside the Shul where you could see the entire city of Jerusalem. The people were amazing as well, many who were friends already and most of the others becoming friends through the program. These were the people I loved being around not only because they are nice and loving people, but because they also were interested in learning more about Judaism. On top of all that, the learning was incredible and in such a limited time each week I was able to learn so much with a great Chevruta. As my Hebrew was improving each week, I was able to understand more and more on my own and it was such a great feeling to be more independent while still have someone else with me who could answer any question I had. I remember each week going in the Shul to study with my Chevruta and wishing I could stay outside and listen to the guest speaker because they seemed so interesting. Yet at the end of the night I felt bad for those who did not have Chevrutas because I felt I learned so much while having a good time. The program gave me a chance to learn whatever I wanted and I appreciated that greatly. The night finished off with a bunch of us walking back home together which was so much fun in itself. Despite the location, people and learning, the real reason myself and most others chose to go to the Beit Midrash Program was the food. I remember the first event of the year not only had a cool band come play, but there was tons of sushi! Everyone was so impressed by the sushi there was no way we were not going to come back the next week. While originally disappointed to arrive the next week and see there was no sushi but bagels instead, the bagels gave me something to look forward to each week. Not only did I enjoy eating them and the famous tuna and other foods that came with them, but I enjoyed hearing the stories about how the bagels got there. I thought it was interesting to hear that the restaurant sent them on a taxi. Something like that does not happen in America. In reality, even though the food was great it was just an extra on top of everything else that helped make that semester my favorite of all four years of my college experience. On June 26, 2012, I lost a very dear and special friend- Jeremy Barkan, z”l. I knew Jeremy as an inquisitive child studying in Hebrew School in Scarsdale, New York. I knew Jeremy as a budding scholar during his high school years. It was no surprise when Jeremy went off to study chemistry at MIT. After making Aliyah in 1982, Jeremy earned a Master’s degree in Chemical Physics at the Technion, and later, an MBA from the prestigious Kellog- Recanti Program in High Tech Management. Jeremy’s intellectual and professional achievements are only a fraction of Jeremy Barkan. The greatness of his mind was matched only by the nobility of his heart and soul. He was loving and kind, warm and generous, a lover of peace and a lover of humankind. He was, indeed, a worthy descendant of Aharon HaKohen. He was a Torah Jew in the finest sense of the word. Jeremy was generous in his giving to charity. He helped needy individuals and worthy institutions. One of his favorite organizations was the RRG Beit Midrash at the Hebrew University in Jerusalem. He chose the RRG Beit Midrash to be the bearer of his mother’s name, Dr. Roberta Barkan, z”l, in perpetuity. He, together with his beloved wife Lisa, sponsored special holiday events, as well as, lectures delivered by Israel Prize winner, Rabbi Adin Steinsalz and Nobel Prize laureate in Economics, Professor Robert Aumann. Jeremy was respected, admired and loved by many. The light of love he poured upon his wife, Lisa, his sons Shachar and Chaim, his father Dr. Paul Barkan and his brother David Barkan and family, will continue to shine brightly forever. MAY WE ALL BE INSCRIBED IN THE BOOK OF LIFE! Click the button below to make a donation (tax deductible in the U.S., Canada, and Israel) in memory of Jeremy Barkan, z"l.
As we read Sefer Devarim, we can tangibly feel Moshe’s unrequited longing for Israel. But why does Moshe long for Israel? Is it as the Talmud asks, that he only wants to taste the fruits of the Land?! To frame the question a different way, what is the unique spiritual nature of Israel? Is there only a historical significance to the Land, or is there something more? The Talmud teaches that Moshe’s longing for Israel is based on a desire to do more mitzvot. A large number of the mitzvot in the Torah are only applicable in Israel. This is true for Jews today; one’s mitzvah count increases exponentially by simply living a Torah life in Israel. Rav Naftali Zvi Yehuda Berlin, known by the acronym the Netziv, explains Moshe’s longings for Israel in a different manner. 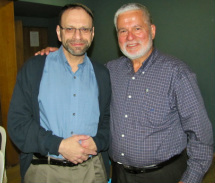 For Moshe, arriving in Israel provides the greatest opportunity to disseminate Torah. There is no wisdom like the wisdom of Israel; therefore Moshe’s lamentations are an acknowledgment of his pain that he will never teach the wisdom of the Land of Israel. The greatest natural resource that Israel has to offer the world today is knowledge of Hashem; the Land is filled with wisdom, as the Talmud itself testifies: the air in Israel makes one wise. As we ponder the greater goals of the State of Israel, and our individual work in it, we must remember that the endeavor of illuminating Hashem’s Torah bears its greatest fruits here. Here you can find blogs posted by Beit Midrash staff and students. Read about what ideas we're grappling with, and see what we find moving.